We Are Neither Heroes nor Villains: The Two Towers – The Bookshelf of Emily J.
I admit it. I don’t really like The Lord of the Rings series, number 2 on the BBC book list. I am dutifully reading them for this blog and for the sake of crossing them off of my list, but I can’t say that I’m enjoying it. In fact, I dread it. I’ve been listening to them on my long drive to school. I recently finished listening to the second book, The Two Towers (1954). I don’t have much to say about it. I listened, but my mind kept wandering. I felt that the story was familiar because I have seen the movies (I didn’t really enjoy those either). There are Orcs, Elves, Hobbits, and Gollum. Let’s talk about Gollum. The part that stood out to me the most, in the entire book, is the part where Frodo wonders: Does Gollum think he’s the hero or the villain? Hmmm. Most of us would say that Gollum is a villain, one who is somewhat stupid and greedy. His villainy isn’t plotted or aimed toward a larger purpose. Gollum is a slave to the ring, and he will do anything to get it, even if that makes him a villain. Yet does Gollum consider himself to be a hero? He leads the Hobbits on their journey for the last third of the book. He leads them straight to Shelob, a man-eating spider. Did he do this on purpose? I’m not sure. But in some instances, Gollum probably sees himself as a hero for helping the Hobbits. He is very likely the hero in his own story, and that is to get back his precious. I don’t wish to recount in this post my thoughts on heroes. I have written about it in “Harry Potter, The Hero Cycle, and Cinderella.” In my undergraduate college years, I had my mind blown by learning about the hero cycle. I felt connected to it, and I see a connection to heroes in most aspects of our culture, religious and secular. Heroes are an important part of any culture. We all have figures, role models, and mythic stories that guide us or inspire us. Heroes are important. So is Gollum a hero? I think not. Yet I do think we can apply Frodo’s question to ourselves. Do we think of ourselves as heroes or villains? I would say most of us are the constant heroes (or martyrs) in our own stories. If something strange happens to us, we see ourselves as the victims and, hopefully, as the eventual triumphant hero. Our side of the incident is the right side. I know I have a tendency to think of things this way. In one particular instance, I’ve been able to step back a bit. I had a particularly traumatic experience with a friend a few years ago that ended with us not speaking to one another. We still haven’t spoken, but it really is better that way. We don’t see each other anymore, we don’t run in the same circles, and the best thing to do was to grow apart. When all of this happened, I felt victimized. I felt like I had been wronged and that this person’s behavior was unacceptable toward me. I felt justified in hating this person. I felt that if people knew what had really happened, then they would know that I was the “good” one and this other person was the “bad” one. Well, some years have passed, and although the way this person behaved toward me was childish and immature (there I go again! ), I can see that in her story, she was the hero and I was the villain. From her perspective, the roles were reversed. And I can also see how her behavior may have been affected by other traumatic incidents in her life. I can be a little more gentle with her. I can see that she needs some mercy, even though I wanted it so badly at the time. We are both heroes and villains, and we are both neither. So which one are you? A hero or a villain? Is there such a thing? Are we both? I think so. I think we are human, which means we are fallible, fickle, carnal, forgetful, silly, and capricious. We make mistakes, we change, we grow (hopefully). The point isn’t to be a villain or a hero. The point is to be ourselves and to be the best version of ourselves that we can, warts and all. The best version of myself includes trying really hard not to be anybody’s villain, but I’m sure I haven’t escaped that role and I may have many more to play. Without question, you are my daughter’s hero. Oh, that makes my day and terrifies me at the same time! I love your daughter so much and I’m glad to know that she looks up to me. I NEED to be better! 🙂 Thank you for telling me that. Wow, you don’t like Lord of the Rings? I don’t even like books and I like Lord of the Rings. I don’t know what to say. I love the idea of the little guy triumphing over impossible odds, because I feel like the little guy so much of the time. I think the point of Gollum is to show a character with both the capacity for great good and great evil which is in each of us. You are spot on with Gollum. I think I identify with him more than any other character. I guess that says something about me! As to not liking them, I know, I know.. I just don’t like fantasy all that much. They aren’t my thing. I think we are both heroes and villains, and sometimes at the same time… It’s just a matter of angle and on which side you are on. However, I think that what counts at the end of the day if we were villains on purpose, if we provoked it or just indulged in some evilness just because it served our purpose. I agree that we need to be the best version of ourselves and never do harm knowingly. Loved your post! Thank you! You are right that we can be both and we need to try not to be villainous on purpose. I try so hard and still end up being on the “wrong” side. I guess that’s just life! Knowing that you are “on my side” makes me smile. I certainly think my side of the story is the right one, but I honestly don’t know the complete other side because she would never tell me. Anyway, it’s neither here nor there, but it was a learning opportunity for me. I like your interpretation of these situations. I have seen that, too. Great post. We certainly all have good and evil inside of us. I think what makes the hero is his/her ability to do good in spite of the temptation to do evil—in other words, overcoming the evil. I also like Gollum because sometimes I get discouraged by the fact that good and evil seem so relative… what’s good for one person is bad for another. I think you’re on the right track with simply trying not to be anyone’s villain. That reminds me of the message in The Fault in Our Stars by John Green: if you seek fame or glory for yourself, you risk hurting others even more. Better to humbly treat others better than ourselves. That’s a great insight. We are all tempted, but how we react is what really determines who we are or who we are becoming, at least in that moment. I’ll have too look at Green’s book. What a great message! I think we are all a blend of both. Circumstances can bring out the best and the worst in us! It’s been years since I read this book. Now it is suddenly in vogue! I think the movies account for its sudden popularity. I can see why people like them. My son, a science-loving six year old, always chooses to be the villain when he is playing. My husband did, too, when he was a boy. Their reasoning is that the villains are the change agents, so if you like to make plans for the universe, being the villain lets you do that. The good guys are just reactive, defending the universe to maintain the status quo. Plus they have big chins. Plus they work in teams with other muscular men. For my quiet little boy, the man working alone to change the world is the one he wants to be. Too bad he’s usually cast as the villain in boy’s entertainment. Oh, and I don’t like Lord of the Rings, either. How interesting! It reminds me of one of my favorite quotes from historian and Harvard professor (and Pulitzer Prize winner) Laurel Thatcher Ulrich: “Well-behaved women seldom make history.” I can see how one person’s villain would be another person’s hero, especially in revolutionary circumstances. Way to bring more complexity into the conversation. I love it! Gollum is definitely the foil throughout Lord of the Rings. 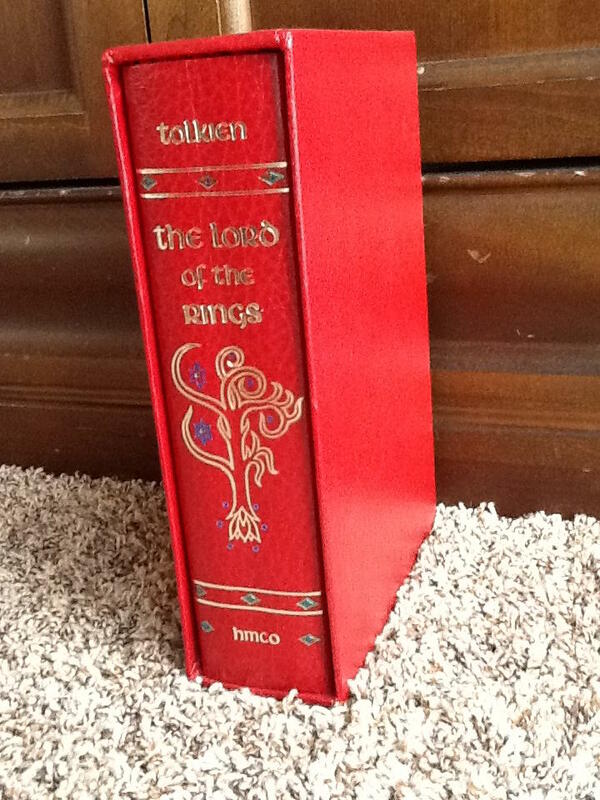 I’ve read the trilogy a few times and have always been a rather dedicated fan of JRR Tolkien’s writings. I understand your argument. It’s a rather present one. We see it in Frodo, Boromir, and Gollum. It is, in a way, human nature. We are all flawed. Frodo, as the protagonist has many things in common with Gollum. They were both affected by the burden they carried. I believe it’s a analogy of some sorts, that explains how an individual can be corrupted through the inside, not just by their behavior but by their thoughts and feelings. These are the one’s that carry the power to destroy. At first, I didn’t enjoy the series. The first book was tiresome to read. However, when I reached the second book, I simply fell in love. JRR Tolkien loved languages and creating these. His works are a reflection of his passion. And I must say, his world is absolutely beautiful. You are so right about Frodo being a lot like Gollum. I love that insight. I think it also shows how alike we all really are, even when we want to distance ourselves by saying that this other person is evil and we are “good.” I am glad you found a way to like them. Maybe I will get there with the third book! I think Gollum is meant to demonstrate the power of the Ring’s corrupting influence. The Ring fractures his personality and turns him against himself. The part of him that is Smèagol is reawakened by Frodo’s kindness, but when he feels betrayed he splits in two and begins an internal struggle that he loses. The evil Gollum side takes over and wins. He deliberately leads Frodo and Sam into Shelob’s lair. His plan was to find the Ring later, on Frodo’s corpse, once Shelob was done with him. I think it’s important to remember that Frodo succumbs to the Ring; in the end, he refuses to destroy the Ring, and instead claims it, but has it bitten off his hand by Gollum. And he possessed the Ring for the shortest time. Gollum had the Ring the longest, and even so you could argue that it did not entirely destroy him. Bilbo had the Ring for the next longest period, and he was able to voluntarily give it up. So, even though Frodo experienced the peril and persevered in his quest, he was the fastest to fall victim to the Ring (shall we put it down to stress?). And he’s considered the “hero” of LOTR. Personally, I think Sam was the hero! The quest would have failed without him. The Ring stands for power. I would say that the message of LOTR is that power corrupts. Corruption is evil. It’s a simple message but Tolkein finds lots of ways to illustrate this one point throughout the entire trilogy. He really hammers it home so we don’t miss it. From the top down to the bottom, everyone experiences the temptation and resists it with varying degrees of success. The successes? Aragorn, Galadriel, Gandalf, Elrond, and Bilbo. The failures: Isildur, Smèagol, Saruman, Boromir, Denethor and, sorry, Frodo. I could be pilloried for that but it’s true. For what it’s worth. I do love LOTR (obviously) although one of my literary heroes, Helene Hanff, also disliked Tolkein. I love your analysis! I can see that you really love LOTR. In my post on the first book, I mused that the ring is pride, but I like your power metaphor more, and it definitely coincides with my idea of pride. And yes, Sam is the hero! He really is. I had an inkling of that toward the end of this book. Sam is faithful and loyal and just great in his humble quiet way. I think there’s a great lesson in that. Sometimes the underdog or the helper or the assistant is the person full of greatness and virtue, and they may not get the credit. But that lack of recognition and humility is what contributes to their heroism. Hey, Emily! I’m from Brazil, and I could see that our favourite books are quite similar, hahaha. I loved the reviews and the blog, congrats! We all tend towards selfishness, which is being the victim but hopefully, at times, we are also capable of being heroes. Like you’ve already found, we often need one time to pass before we can see things more objectively. Good post -you have a great skill in drawing out little threads of thought from something that most of us would just ignore. We do all tend toward selfishness, don’t we? I think it is human tendency, and the heroism comes in when we can overcome those impulses. Thank you for the kind compliment! I think we all have our own insights that stick out to us because of life experiences. I am sure there are many things I missed while I was letting my mind wander! I admit I often imagine myself the hero and, very rarely, the villain. If you ask a “bad” person about his or her motives, you’d find the person justifies the actions they took. All about perspective, I guess. I have almost given up several times! You are right that we all justify our behavior, even when it is atrocious! 🙂 That may be the only way we can handle things, and I see it as a coping mechanism, even if it is a cowardly one. I’ve been steeped in LOTR lore since early childhood, so I never really understood these were fantasy-genre stories until recently when someone pointed it out. They aren’t any different than the Bible stories I was also steeped in, parables that tell of good and evil and how a person aught to behave. I don’t typically enjoy the fantasy genre, but do love LOTR, the Hobbit, and the Silmarillion. O geez, I’m rambling. My point is; I do like that you point out hero in Gollum, as he is so often seen as only a villain. Villains never start out that way, they were all once good people who were influenced by strong forces of one kind or another. I think Frodo became the hero of these stories, despite his failure in the end to resist the power of the ring, when he felt pity for Gollum and was able to recognize Smeagol and call the humanity back out of the villain he’d become. Gollum and Frodo saved each other for awhile. I think I am a villain a lot of the time (and most people are,) not out of a desire to be mean, but because of strong forces in the world that twist our good nature. I’m only rarely the hero, mostly I’m that average person in between. You make a good point about the power of myth and storytelling, and the Bible is no exception. There is a definite mythic/biblical influence in LOTR. You are so right that there are forces that twist our nature, but I would also say that we have control over how we react to those forces at least some, if not most, of the time. I can so relate about dreading reading this book! I ploughed my way through and could never work out why I didn’t enjoy it… At least you are listening to it. Make any book more bearable somehow. Listening does make it more enjoyable, but kudos to you for slogging through it! I really like your perspective on how we usually see ourselves as the hero, and hardly ever the victim. I agree that most of the time we are usually a bit of both. I think that thinking this way opens a doorway to considering how our actions affect ourselves and others. Great post! I think it definitely reminds me to do some self reflection every so often. It helps me to be a better person and it is much needed! I am also listening to “The Lord of the Rings.” I have only listened to the first one so far. I enjoyed it overall, but my mind wandered at parts too. The quest feels aimless at times once they leave Rivendell. Are they going to Gondor, or what? And then the fellowship just falls apart. But when they go to the second fairy place, Loch Lorian, or however it is spelled, is a really special part of the book. The movie didn’t do these fairies justice. I love fairy tales and myths and I think he did an excellent job in creating this world. I am kind of dreading “The Two Towers” because in the movie it is all about the battle, and I am not a fan of reading/watching war. But I know these books are beloved and I am listening to them because I don’t want to interrupt my reading plan to squeeze these in. I think I will do the same with the Harry Potter series. I read the first Harry Potter and while I enjoyed it I didn’t feel compelled to read the entire series. But then I realized I am left out of a huge modern pop cultural thing by not participating. However, I draw the line at the Twilight series and the Fifty Shades series. I can’t bring myself to participate in the dumbing down of writing and story telling. I draw the line there as well! I would suggest that you finish the Harry Potter series, however. Those really are fantastic books! (I would say much better than LOTR.) But that is just my opinion. I love Harry Potter for the hero cycle and for the beautiful lessons it teaches, and as a mother, I seem them as great children’s literature because of that. I hear what you are saying about the battle scene in LOTR, but surprisingly, that was the only part of the movie I liked because Gandalf arrives in mighty and glory and it is all so moving. Haha, Tolkien’s books are THE foundation of my love of literature and writing, and all things fantasy.  I think the reason Tolkien’s work has appealed to so many people is something that you mention – the blurring of the line between hero and villain. Underneath the strange lands and people, human nature is still very much the same. Frodo and Sam, Merry and Pippin, they’re not heroes. They would never want to be called heroes. They’re average people, uprooted from their lives and thrown into circumstances initially beyond their understanding. But they did what they felt they had to do. And they made a difference. It’s a common theme we can all identify with; the little guy, triumphing. Because each of us has been the “little guy” at some point or another in our lives. Gollum is such a complex and valuable character. He sees himself as the person who’s been wronged. The ring was his initially, he lost it, it should be returned to him. (He does lead Frodo and Sam to Shelob’s lair on purpose; he plans on reclaiming the ring once she eats them.) But, he doesn’t realize that it was Sauron’s first and foremost. It’s ONLY Sauron’s. And without Gollum, Sauron would’ve reclaimed the ring, since Frodo couldn’t destroy it in the end. Marie Anne, I love your thoughts! You know so much and obviously paid closer attention to the overall arc of the story than I have. 🙂 I love what you say about the little guy and how there can be a lot of consequences, intended or not, from one simple action. Thank you for adding more to my paltry review! I am just not into the books, but I am trying to give them a chance. Emily, I love how you can take a not particularly rewarding reading (listening?) experience and find something personal, something the mull over and grow on and from. One of the quotes I often hear from Tolkien in re: other’s stories vs. our own is :”It’s not your story,” meaning we often try to find ways to insert ourselves in one another’s stories, or even write our own based on how someone else seems to see us. You touch on all of this in your post with your sharing about your friend. Sometimes, when we step back and look more objectively at an event, we can see where the stories have gotten muddled and can remind ourselves what is and isn’t our story. I think many of the the experiences the various characters go through in TLOTR trilogy keep coming back to this point. I’m sorry you aren’t enjoying the books and I admire your tenacity in powering through them. You are a better woman than I would be in the same situation. I have some friends who love the series and talk about it all the time, often leaving others out all together. They can’t understand why other people haven’t read the books or show no interest, etc. etc. I admit to not being the least interested, until my son expressed an interest. So I agreed to read them all aloud to him. We are nearly finished with the first book and it has been a truly wonderful experience. On my own, I likely never would have cracked them; but sharing the stories with him (he can only see the film versions after each book is finished) has been lovely. I love that idea that it isn’t our story. So true! It sheds even more light on that situation I described. I also like that you are reading them to your son! We do something similar with Harry Potter, where she can watch the movies after we read the books together. I like that approach and it is nice to know that you are doing that too. Yes, always read the book before the films in this house! 🙂 My son just finished reading all of the Harry Potter books and we watched the movies after he read each one — he wasn’t too impressed with the films, but liked the books quite a bit. I’m curious to see how he reacts to the LOTR movies. Enjoy your reading time with your daughter — such a gift, isn’t it? Definitely a gift! I had a great moment last night while helping my daughter with her homework in which I realized that she would not be this cute or this young for much longer. I can’t fully describe it, but I tried to take a picture in my head! They grow up so quickly. YES! My son is almost 12. The changes he is experiencing now are dramatic and not a day goes by when I don’t have the same thoughts which you describe. Every moment is precious. It is so hard to see them grow up, but it is also such an immense privilege. Pingback: How Being a Parent is Like Being a Hobbit | The Bookshelf of Emily J.
Pingback: Abandoning Books | The Bookshelf of Emily J.
Pingback: Girls’ Studies: Mean Girls and Frenemies | The Bookshelf of Emily J.